Iwata airbrushes are the highest quality airbrushes available on the market, with a range to suit any application. 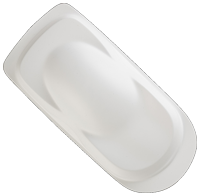 An entry-level Iwata gives better performance and control than the top of the range in any other brand! Whether you are buying for the first time or upgrading your airbrush, an Iwata airbrush is the only choice for the serious modeller. Click here for more information on Iwata airbrushes. 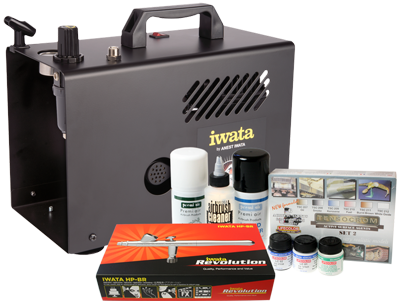 Save money on an Iwata airbrush and compressor, bundled with LifeColor paints and airbrush cleaners - everything you need to get started on achieving the perfect finish to your models. Please select kit options above before adding this kit to your shopping cart. The Power Jet Lite compressor is a quiet-running, twin-piston, automatic compressor with pressure regulator, pressure gauge moisture filter. It will run two Iwata airbrushes. 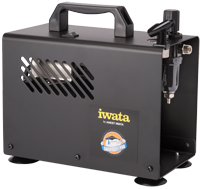 There is a choice of base kits, one for each model of Iwata Studio Series compressor. 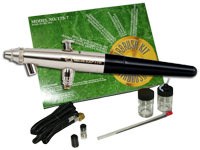 Each base kit contains a choice of Iwata Revolution BR, CR or BCR dual-action airbrush, but you may upgrade to an Iwata Eclipse, Iwata High Performance Plus, Iwata Hi-Line, Iwata Revolution TR pistol trigger airbrush or an Iwata Custom Micron C Plus. This promotion gives you ultimate flexibility depending on your requirements and budget. Please click on the airbrush models above for more information and select kit options above before adding to your cart. The kit comes with LifeColor Matt Black, Matt White and Thinner, plus your choice of LifeColor 6 Set. Please select your choice of airbrush and paints above before adding this kit to your shopping cart.